Aluminium pivot doors are hugely popular in upmarket property developments and renovations. These doors are designed to enhance the welcoming feel of your entrance and make a memorable first impression that promotes class and comfort. These aluminium pivot doors allows a flow of natural light into the space which helps create a light and fresh atmosphere in the area. These doors are perfect for modern homes, these generously sized doors seems to be defying gravity by appearing to float in the opening with no effort. This is because of a recessed bearing placed in the floor that makes the Aluminium door pivot in a smooth action. Weather strips are installed at the top and bottom part of the door to ensure that when the door is closed the entrance will remain weather and water proof. The designs of these aluminium pivot doors are simplistic and timeless to ensure that they fit into any architectural design. We also have a variety of colour available to best match your style and décor. We make use of the highest quality materials which ensures long-lasting durability. 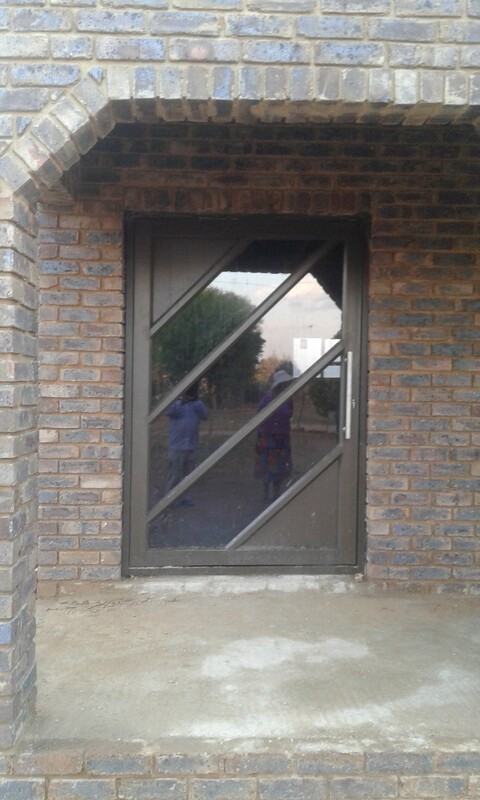 Aluminium pivot doors are super light which makes them really easy to operate and as an added bonus puts very little strain on the moving parts – this makes the wear on the parts almost non-existing. These doors are silent when operating also because of the light weight and the use of high quality hinges. The use of this materials to fabricate these beautiful doors ensures less maintenance and more security.